I have a son in kindergarten. I want him, and every other child in the world, to be able to attend school without fear and without a risk of grave bodily injury or death. In this article, I propose some ideas on how we can use our collective intelligence to identify and prevent future school rampage events. I do not want to see another mass killing occurring at a school. These events must not happen, but I know that there are no easy answers to this problem. In this article, I use the term perpetrators to describe people that have been stalking our schools with the intent to kill our children with automatic weapons. Why shouldn’t I just call them school shooters, or school killers? As you will see, this activity has been going on for more than 100 years in the US, and it has only been in the last 20 years or so that the automatic weapons have become the killing agent of choice. These weapons of mass human destruction have lead to an exponential rise in the number of school rampage victims. To begin my investigation, I grabbed data from this website. After cleaning the data, I created the table of events shown in Figure 1. The events that exist in this table are the rampage, mass killing events that have occurred in schools around the world. To make this list, the number of killed and injured victims (total victims) has to be at least 14. Figure 1 – The worldwide list of rampage perpetrators that have targeted schools. 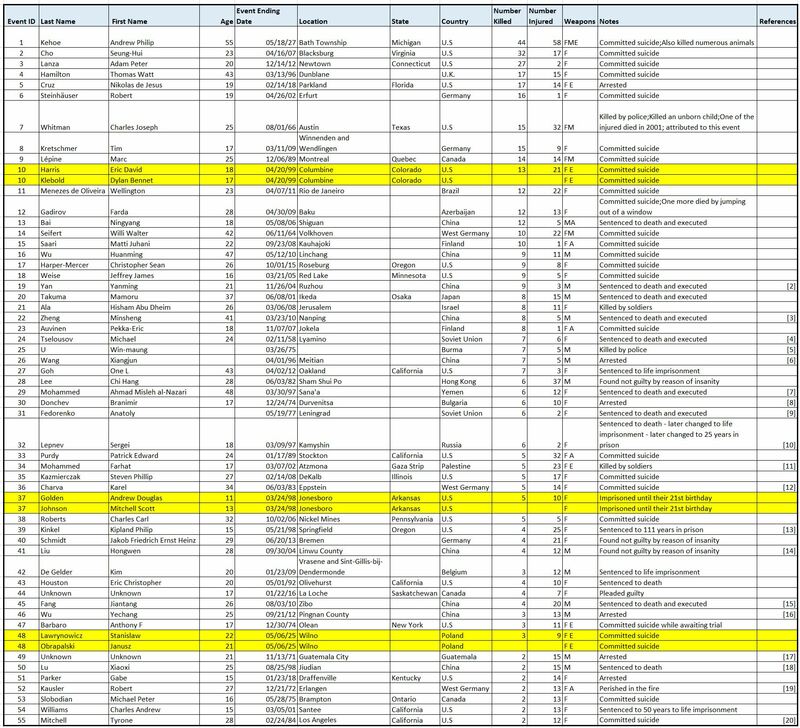 This list is limited to individuals, or the three duos (shown in yellow), that have attacked children while they were at school. The rampage term is used because these events happen at one time, without a cooling-off period. For a more comprehensive list of major group attacks on children, visit this site: https://en.wikipedia.org/wiki/List_of_school_massacres_by_death_toll. You can click on any of the graphics to get full resolution versions. To create ideas of how to identify and stop these people before they commit their heinous acts, I needed to better understand the basic questions of who, what, when, where and possibly, why anyone would want to do something like this. The last question is difficult to answer because as you can see from the notes column, most of these perpetrators are either dead or were judged to be insane. I am not a criminal profiler. I am a data analyst. My wife always tells me that people will show you who they are if you pay attention. Since we have a data table that gives us basic information about the perpetrators, we should be able to learn about who these people are in an attempt to determine who might become future perpetrators. Figure 2 shows a histogram of the perpetrator ages. What we can immediately see is that over 83% them are under the age of 30. In fact, about 78% of them are between 15 and 30 years old. That helps narrow down the population of potential perpetrators. Additionally, I believe that they are all male. I am not positive of that because I didn’t research every case, but let’s just say it is very likely that future perpetrators will be males. 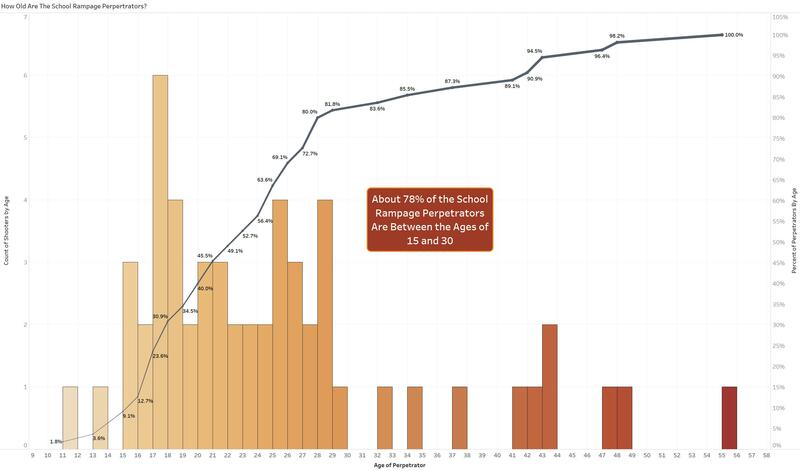 Figure 2 – The age distribution of school rampage perpetrators. The answer to this question is almost self-explanatory. The perpetrators attack unsuspecting students and teachers at school and they use a variety of devices designed to maim and kill. Figure 3 contains the descriptions of their weapons of choice. These codes can be cross-referenced in the “Weapons” column of Figure 1. Since multiple types of weapons are used, I cannot just call these people “school shooters”. Given recent history, however, it would be reasonable to use the term “school shooters”. Figure 3 – The weapons used by the school rampage perpetrators. 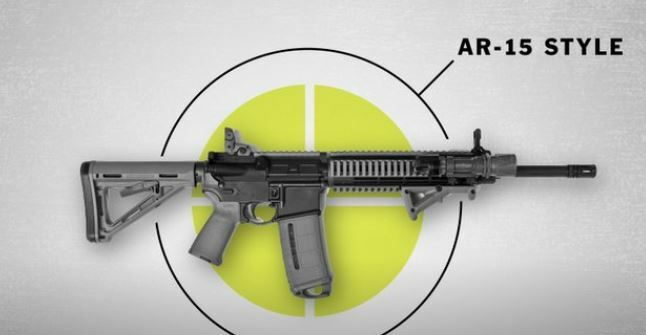 What we know from recent mass shooting events, is that the semi-automatic weapon like the AR-15 rifle shown in Figure 4 is a popular choice for the school perpetrators. They can easily carry plenty of bullets in pre-loaded magazines and go through many cycles of reloading without much trouble. This is a very effective killing device, not only because of its speed of shooting and ease of handling the weapon but because of the kinetic energy of the projectiles it launches at our kids. These projectiles inflict a lot of damage to the human body. If you get shot by one of these bullets, generally you are going to lose. Figure 4 – The AR-15 style rifle, which is quite possibly the weapon of choice. In many states, you can purchase this type of military assault weapon before you can purchase a handgun. I would like someone to explain to me why that is a true statement. The answer to the “when” question can now be stated in one word: soon. Recent history indicates that it will not be too many days into the future when another event is going to happen. Figure 5 shows that these events are now occurring with regularity, even if they don’t make headline news or have enough victims to be included in the table shown in Figure 1. Figure 5 – According to CNN, there have already been 8 school shootings in 2018, and there were 47 of them in 2017 (Don Lemon, on air on 2/16/18). Yesterday we saw another major school shooting event occur in Florida. Apparently, the FBI was given detailed information about this perpetrator in January that basically outlined what he was going to do. They failed to act on the information and now 17 kids are gone and many lives are shattered. It has been obvious to me for many years that we cannot depend upon the FBI or local police authorities to prevent these events. We need a larger threat detection network, comprised of people like you and me. In a more positive occurrence, on the day before the Florida event, another teen was arrested north of Seattle because his grandmother read about his plans to shoot people at his school. He was studying previous shooting events to avoid making the mistakes that other school shooters had made. He had chronicled his plans in his journal, which his grandmother happened to read. Without her careful consideration and decisive actions, we would have had another event to talk about in the near future. Now getting back to our primary database of historical events, Figure 6 shows the rapid escalation of school rampage events post-1996. For nearly 2 decades we have seen this same story repeated over and over. I believe that it is time for people to collectively decide how to help reduce or eliminate these events. 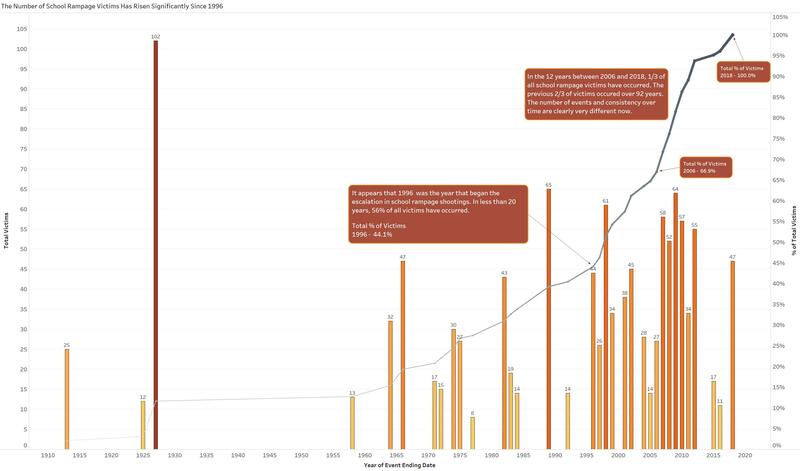 Figure 6 – The time series history of school rampage events shows a big change in the frequency of events. As shown in the Figure 7 world map, these events are not isolated to North America. The total victim count can be seen in Figure 8, with the United States being the location having the highest number of incidents and total victims. 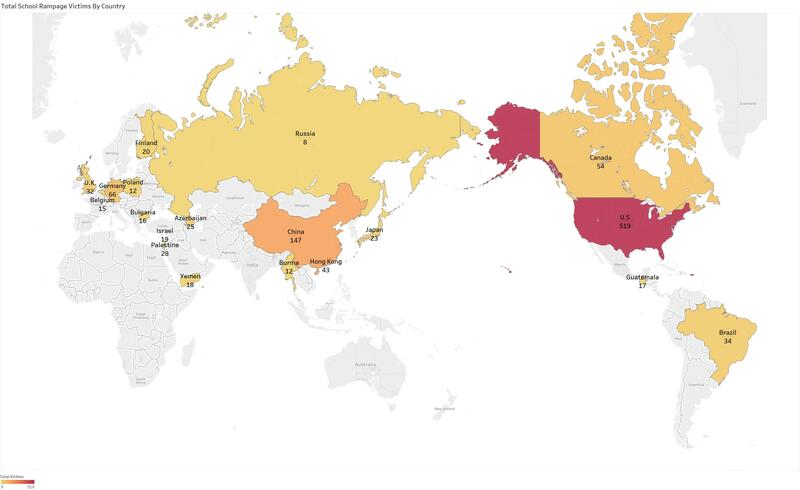 Figure 7 – The worldwide distribution of school mass rampage events listed in Figure 1. Since the United States and Canada are at and near the top of total victims, it is worthy to look at the geographical distribution of events. Figure 9 shows the state-level total victim counts in the US and Canada. The good news is that there are a lot of states that do not show up on this map as having these types of mass rampage events. The bad news is that many of them have had smaller events as indicated in Figure 5. Unless we work together to find a solution to this problem, I’ll be showing an update to this article in a few years in which many more of the uncoloured states have reported events. This problem is not going away by itself any time soon. Figure 9 – The US States and Canadian Provinces that have had school rampage events.The total victim count is shown below the state name. Figure 10 presents the total victim count by state/province for easy comparison. Hundreds of lives have been lost and countless thousands of friends and family members have had to endure the grief and heartbreak of these situations. It is time that we work together to find a way to reduce or eliminate these events. 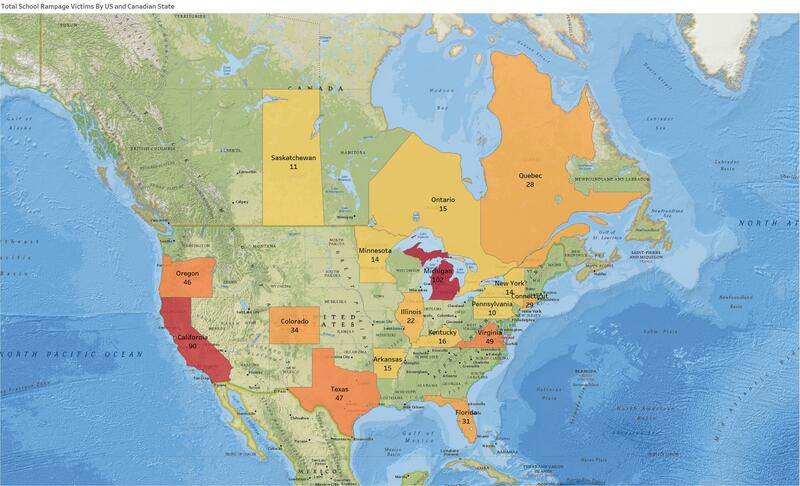 Figure 10 – The total victim counts by US state and Canadian province. After these events occur, everyone wants to know “why” the person decided to commit the crime they chose. The recent Las Vegas shooter, who attacked unsuspecting people at a concert, is the most recent mass rampage case (not school related) that has left us collectively wondering “why” this happened. We know a lot of the reasons why these occur because many studies have identified these conditions. Bullying, mental illness, retaliation, abuse, and many other reasons have been uncovered. Unfortunately, knowing why someone did something after they did it does not necessarily help us detect and prevent the next event. Considering the age grouping of the perpetrators, there can be many personal conditions that can lead an individual down a path to destruction like this. Drug use, immature brains, hormonal imbalances, irrational fantasizing, personal trauma and unstable home conditions are several examples. Copy-cat phenomenon, leaving a legacy (although a notorious one), and just pure evil are other reasons why these occur. Given the multitude of possible reasons why people decide to commit these events makes it hard for us to know which one of them is brewing inside someone that is considering committing such an event. There is one thing that many of them have in common, however, is the need for notoriety and the need for creating fear. The way that they do this is by broadcasting their intentions on social media. This is a good thing for us because this gives us a chance to detect and prevent the next event. We have the collective power to use computer sciences to help us detect future events. We can lobby the companies behind widely used social media sites like Facebook, Google Services, Amazon Services, Twitter, Instagram, Snapchat and various other platforms to use established technologies (machine learning algorithms, artificial intelligence methods, etc) to help identify potential perpetrators. For example, I could imagine Instagram running incoming photos through an image detection model that identifies pictures of AR-15 type weapons, or even guns in general. What if Youtube videos were scanned and the text was scanned to detect hostile language? The recent Florida school shooting perpetrator was detected on YouTube by someone in Mississippi, but the FBI was also unable to act upon that “actionable intelligence” many months before the recent event occurred. How many cases have we seen, going way back to the Virginia Tech shootings, where the perpetrators openly broadcast their hostilities on social media before committing the crime? If machine learning tools were used to scan photos and videos being produced by males in the 15 to 30 year age group, we could rapidly develop a list of potential future perpetrators. I know what many people are thinking: that is a violation of privacy! I do not think so. If you openly express your hostile intent by stating that you want to be a school shooter or by producing videos of yourself with military assault weapons, I believe that you have given up your privacy. By promoting yourself this way, you have made your intent public and it is fair-game that we identify you and let the authorities know who you are. This leads me to my final thoughts on this topic. We know that our government isn’t going to help us. Our President will never really care about these events, nor will our currently configured Congress do anything about this problem. Their response to these events is always the same: “Now is not the right time to talk about this!”. The ineptness of the FBI has been demonstrated time and time again, even when they are given “actionable intelligence” on a platter. Therefore, it is up to us to collectively become aware of the trends and patterns of these events. We need to work together to identify and prevent future events. If you know people that work on image detection systems and machine learning algorithms, encourage them to get involved. Encourage graduate students in these fields to consider doing studies on this topic. Encourage people you may know that are strong in predictive analytics to think about ways of using their skills to fight this problem. Most of all, pay attention to young males you may know that exhibit any signs of hostility, loneliness, and/or depression. These characteristics often are present in the perpetrators of these crimes. Take the time to connect with these young adults. Listen to them and try to help them resolve their issues. Do not underestimate the power of simple observation and personal intervention in these cases. If you know a depressed young adult that owns a military-style weapon, intervene and help save innocent lives. An AR-15 is a semi-automatic assault rifle which means that you fire one round every time you pull the trigger. There is an after-market conversion kit that will allow it to be fully automatic like the M-16. I think that has been used in some of the school shootings, but it is not actually a significant factor in the deadliness of these weapons. To answer your question about why you can buy an AR-15 before a pistol, it is simple – you can’t really conceal a AR-15 but you can conceal a handgun. I believe the distinction is ‘long gun’ vs. ‘hand gun’. The belief is that you will buy a long gun to hunt, but a handgun is more usable for crime. That may even be true. What it misses is that to commit a massacre you really don’t care who sees you. I wonder if a Markovian Arrival Process would help answer the question about when. I am not sure how that sort of process adjusts with time – I think you are correct that something changed along the way to increase the frequency. 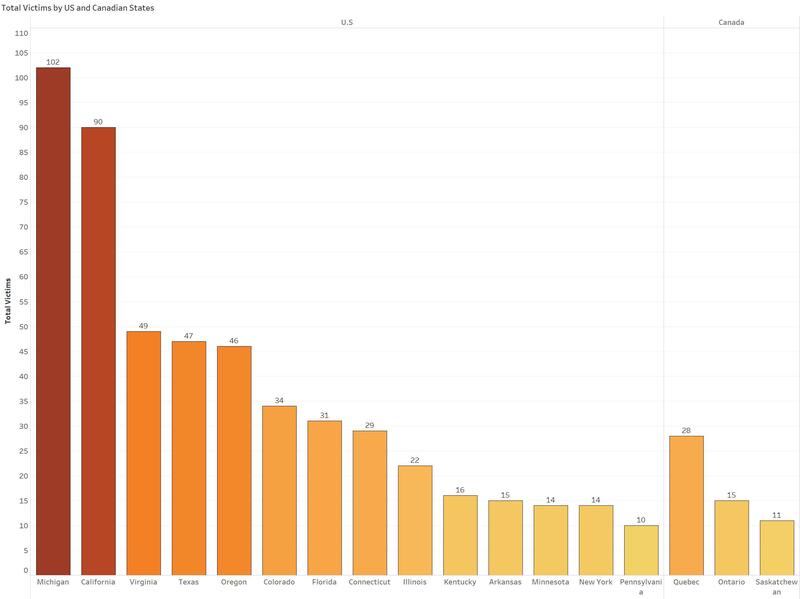 Some analysis of number of victims per incident by weapon might be telling. 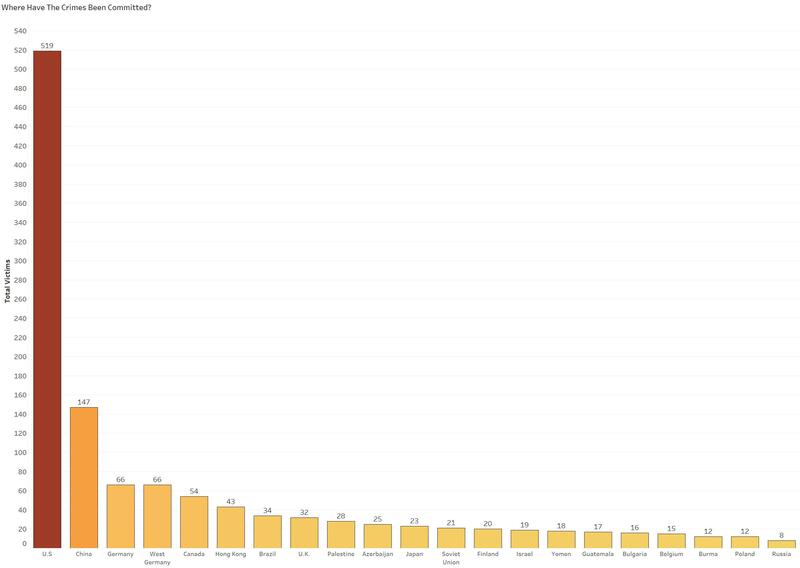 I would think that the number of incidents is proportional to population You might want to normalize the data at the state level. It would also be interesting to compare that versus strictness of gun laws, vs. spending on mental health, law enforcement and so on. These events are infrequent enough it is hard to show causality though. For what it is worth, the problem of detecting these perpetrators has been tackled before, in the wake of 9/11 and is quite difficult. One can devise a test to identify a possible terrorist or school shooter, but if it is 99.9% accurate, it will still mis-identify a giant swath of the public as false positives. Just taking a quick number I found for 15-24 year old males, 22,213,952 x 0.001 means you have 222,213 errors in the algorithm, of which most of them will be false positives. Out of that population you are trying to identify on the order of 100 people. One of them will be a false negative. There’s certainly a lot we can and should do, and ideas like the ones you presented are very valuable. I do think it will take a national will to solve the twin problems of widespread availability of weapons of mass killing and the epidemic of mental health problems that I think are the root causes of these massacres. Thanks for writing such a great reply. I don’t think this will become a field of research for me, but I am about to delve into tensorflow applications. I cannot predict where I will head with this topic, but I feel it is so challenging and so important for us to confront. Sometimes just creating a spark of an idea can send someone with real talent down a path of helping to find a solution. When you think about all the resources the FBI has and the fact that he was sent to them many times, essentially being handed to the FBI before the incident occurred, it makes me feel like there might not be a solution that can stop all events.